What's up guys and welcome to yet another paint brush review. My name is Brian and I will be bringing you all the latest in what you should know about painting, the Purdy XL is no exception. I thought for this review I would do something different, you know, (change things up a bit) and keep things real and interesting; challenge the status quo and claims so-to-speak. So, instead of giving you my review of the Purdy XL, I turned to YouTube to evaluate how others use the brush and their results and summarize it for you. I've been reviewing paint products for over 20 years and painting for 30 years. I like to think of those years as learning how to spot poor product design. I am able to take that information and translate it into what it means to you. I give it to you straight without bias, opinions, and without the fluff and marketing propaganda (see below). Trust that I have no agenda other than steering you in the right direction by making smart buying decisions to save time and produce professional results regardless of experience. So, what is it about the Purdy XL? THE GOOD / The Purdy XL has long-lasting construction and its available nearly everywhere. You can practically find an XL anywhere Pepsi is sold or in some dark lit alley from a guy pimpin' brushes out of his trunk. Build quality is high-level stuff sporting a bronze ferrule. You'll often hear painters boast about how long they've had their Purdy brushes as if there is a longevity achievement award or something. THE BAD / But, nothing says poor performance for years to come like ancient flagged filament design. The Purdy XL is a thin brush although I use other adjectives such as "dainty" and "puny" to describe the XL to my friends. The narrow footprint lends to poor control and produces inconsistent cut-line sharpness, streaky finishes, brush marks, poor release and little hold capacity. Weak filaments also bend easily when the brush rests in the paint can making the brush more difficult to use. The degree of sharpness measured in brush design is in the strength of the tips. Due to the flagging process on the XL; the tip ends are split and bend easily (precisely what to avoid). THE BOTTOM LINE / This may be one of the longest lasting brushes money can buy, although you may want to shop for a better performing brush than the Purdy XL or jobs may be long lasting too. The Purdy XL behaves like what you'd expect from an entry-level brush with no resemblance to the characteristics found in professional brushes used by pros. Its wavering slow performance is sure to drag out the day and you may find masking trim to be quicker than freehand. Purdy talks about the versatility of the XL as if that's a good thing. That only translates to how much more stuff you can mess up. THE CONCLUSION / People seem to enjoy the Purdy XL above the others for its cohesive construction, convenience, and perhaps claiming that you had the same brush for 10 years, but I ran into too many performance pitfalls to be able to recommend the brush to anyone. My advice based on the videos watched and my experience is to shop around. If there was such a thing as a brush to make your job difficult, this is it. 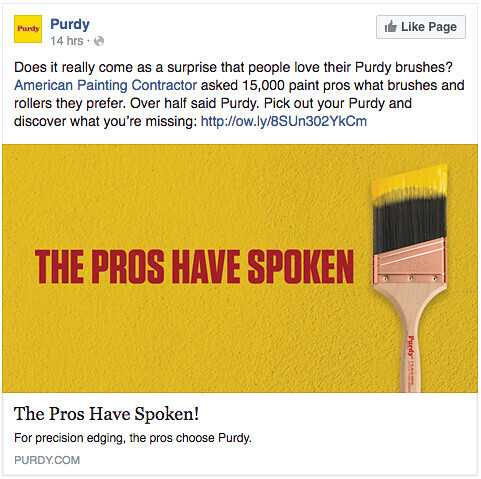 Purdy's popularity is not due to performance, rather "convenience" when no other better brush options are available. If you were standing in a Sherwin Williams store, Purdy is what you buy because there are no other better options in the store. If you value performance over how long a brush lasts, there are other brushes in the same price range or almost half the price that provide better value. They may not last nearly as long as an XL, but you shouldn't care because your time is worth far more. THE EVIDENCE / Don't take my word for it, hop on YouTube and watch countless painters struggle to use the XL. Also watch the videos Purdy produces for the brushes. You'll notice the videos are very different from the videos I publish. The same painters will tell you how much they love their Purdy brushes, but I trust you're smarter than that. Take it for what its worth; you've been warned. In a way, I want you to try the XL, but only for reference on how a brush shouldn't perform. There ya have it. That's the short review version. Look for part two titled "How to fly a brush" which talks about my life with an XL which later became an EX I never want to see again and the struggles throughout my journey as a painter. PRODUCT ANALYSIS / Any analysis of a product must account for, not ignore or violate, these contexts. Despite the uselessness of the argument of asking "15,000 paint pros" what they think, I’m not inclined to concede the point. I’ve already implied the goal was polemic—a dismissal of marketing propaganda that speaks nothing into the capabilities of a brush, rather 15,000 opinions that speaks to their experience as painters. It was their way of claiming their brushes and rollers were "preferred" and, therefore, superior to those of their competition. The common mistake Purdy or any company makes is assuming anyone who paints is a pro. Making assumptions is what prevents products from improving. If you ask 15,000 people what they think with that kind of response, they have no reason to improve their line of brushes. This is precisely why I have not witnessed one single improvement in 30 years coming from Purdy. We may as well say the number is 100,000, the brush is still a poor performer. No number of testimonies will change what we all can witness on YouTube. The only real decision you need to make is, do you want to paint like they do? REMEMBER THIS / The best brush ever made will not produce the best result in the hands of limited experience. Likewise, the best painters are prevented from achieving quality results, in which they are capable of, if painting with inferior products. It’s apparent both "experience" and "product" are absolutely necessary. The quality of both “painter” and “brush” have a bearing on the quality of the end-result and the time in which it takes to produce it.